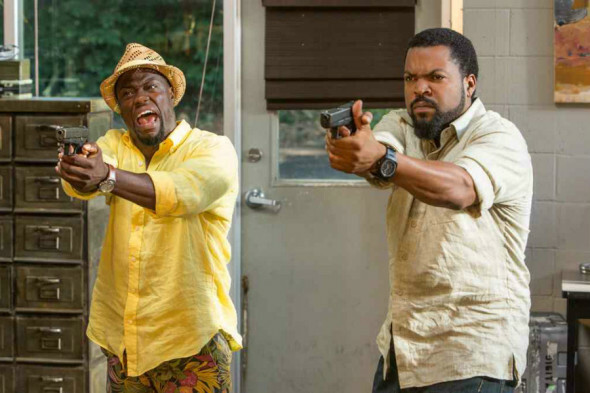 A year ago, Ride Along used the 48 Hours formula to give Kevin Hart a mainstream buddy cop vehicle. It worked, at least at the box office, so part two rewrites another Eddie Murphy classic to equally disappointing results. Since emerging as a bumbling hero in part one, security guard Ben Barber (Hart) has become an actual Atlanta police officer. But, he’s still just a rookie beat cop, several rungs below his future brother-in-law, veteran detective James Payton (Ice Cube). When they bust a local thug with mysterious ties to the Miami crime scene, James gets the green light to head south alone and follow some leads. Ben? No way! He’s too green and unfocused, and still has no idea what serious detective work is about! Shut up, it’s not gonna happen! So it happens, and the pair hits South Beach, spurring Ben’s hope for a catchy nickname such as “the Brothers In Law!” In short order, the BIL team up with a Miami detective (Olivia Munn) and a computer hacker on the run (Ken Jeong) to try and prove a prominent businessman (Benjamin Bratt) is actually a violent crime lord. As with the first go round, Ride Along 2 makes you wonder why it’s taking so long for a film to take full advantage of Kevin Hart’s comedic talent. The About Last Night reboot came close, but Hart’s was a supporting role overshadowed by the boring leads. Here, it’s the laziness of not rocking a popular boat. Director Tim Story and screenwriters Phil Hay and Matt Manfredi all return from the original Ride Along, crafting an obvious rewrite of Beverly Hills Cop with an over-reliance on Hart making faces, Cube looking tough and Munn sporting cleavage. All three are better than this. There are a few genuine laughs here, but they are buried under silly contrivance and the dead horse beating of James and Ben’s no-you-can’t-yes-I-can banter. We get it. What we don’t get, again, is a project that takes full advantage of the talent involved.